Looking for the perfect way to display your homerun baseball, touchdown football, hole-in-one golf ball or other memorable sports ball? Our collection of sports ball trophies and display cases has what you need. Great for showing off game winning balls for your favorite sports, they're also wonderful for creating coaches gifts – have the whole team autograph the ball and present it to the coach. 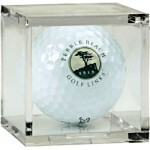 You can also use them to display collectible autographed balls from your favorite players. One creative client purchased a dozen baseballs and ball holders for his son's birthday party – the kids sat and autographed each other's baseballs and were given their autographed baseballs and ball holders as party souvenirs!